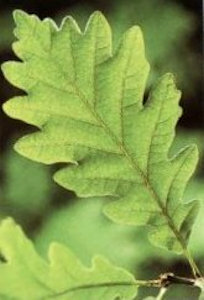 Quercus is a genus of about 600 species of deciduous, semi-evergreen and evergreen monoecious trees and shrubs. Nearly all are slow-growing and long-lived species, some reaching heights of up to 40metres. 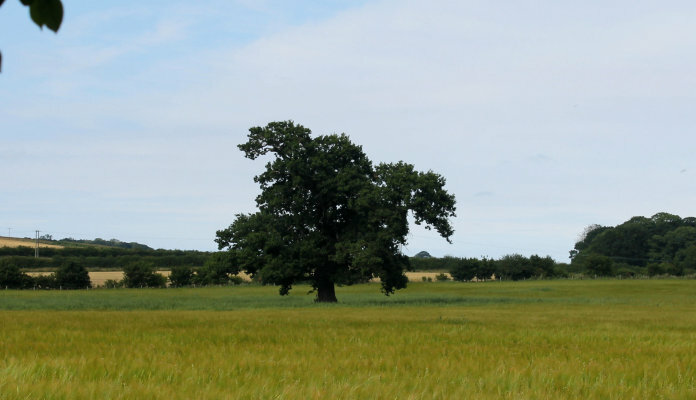 Field-growing Quercus robur / English Oak tree, photographed in Norfolk, England. Quercus cerris/ Turkey Oak A tough, fast-growing deciduous tree, grey-white bark that splits into plates, oblong lobed or toothed dark green leaves up to 12cm long. Can reach heights of up to 25m in its native Central and Southern Europe. Fully hardy as an ornamental tree, Turkey Oak requires some protection from hard frost when grown as bonsai. 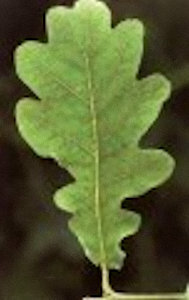 Quercus petraea/ Sessile Oak Closely resembles the English Oak Q.Robur but has longer leaves of between 6-17cm. Commonly reaches heights of 30m in mainland Europe. 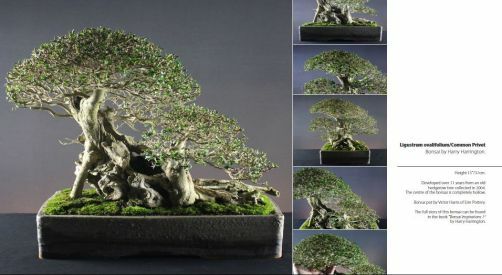 Fully hardy but needs protection from hard frost when grown as bonsai. Quercus robur/ English Oak Slow-growing and long-lived deciduous tree. Lobed leaves are yellow-green in Spring turning to bronze in Autumn up to 5-15cm long with very small stalks. There is much hybridization between Q.Robur and Q.petraea found growing in Europe. Height to 35m. Superb English Oak bonsai, photographed at the Wessex Bonsai Show UK, artist unknown. Position Full sun and good air circulation. Protect from hard frost below -5°C. Shaded branches on Oak bonsai have a tendency to die-back. Feeding Every two weeks at half strength after first growth has hardened off in Spring. Pruning Trim new shoots and pinch out apical buds unless extension is required. Defoliation Complete defoliation can result in larger leaves and on weaker trees, dieback of lower branches. Infrequent repotting helps reduce leaf-size, as does removal of apical/terminal buds before they extend in Spring. I have had very good results from regular removal of all large leaves (except those on the weakest branches) and thinning of the foliage at the tips of branches. 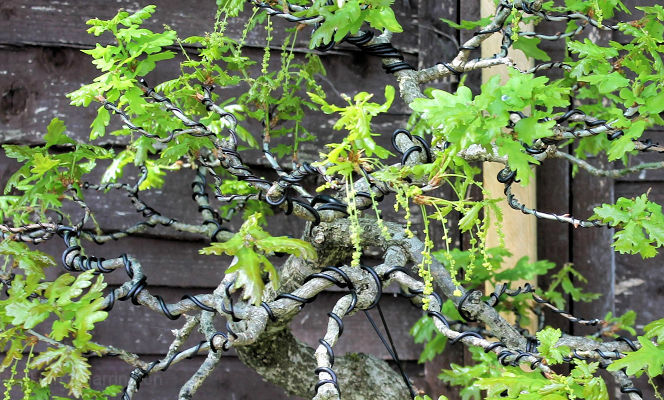 The tips of most Oak branches will produce a swirl of 4,5 or more leaves, remove all but the smallest to prompt creation of a new flush of smaller leaves. Propagation Sow seed outside as soon as ripe. Air-layering with difficulty. Pests and Diseases Very susceptible to mildew problems unless good air circulation is provided, also oak wilt, aphids and gall wasps. Styles Upright and slanting styles, multi-trunk styles, group planting in medium to large sizes. Suitable for subtle deadwood features. Pots Glazed in light and textured, earthy colours. Fresh green and flowers of an English Oak in Spring. These are followed by acorns in the Autumn.